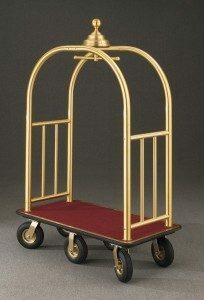 If you are in the market for affordable yet beautifully designed bellman carts (also known as luggage carts), Glaro.com Glider Bellman Carts are a great solution to consider. In addition to the manufacturer’s quality and overall design, it is remarkable to find a USA manufacturer that produces as many fine carts to address all of the choices that people want in the market. Not only is there a selection of 15 designs in three different sizes, but there are also over 31 finishes available. Standing apart from so many companies that have sent their manufacturing operations and jobs overseas, Glaro’s true identity as an American company since 1945, when it was founded, has always been consistent. Glaro bellman carts are part of a total “American-made” concept that permeates every product line that Glaro Inc. makes. Interestingly, when Glaro demonstrates carts at trade shows, a crowd often gathers to see how easily these bellman carts maneuver in tight spots and how flexible the design options really are such that a customer can practically create his or her own bellman cart to meet the design and functional requirements at their facilities. For the first time, we have seen a bellman cart that can be pushed, pulled or rotated in place when loaded to capacity with luggage, and still can be moved effortlessly. The exceptional ease of movement is the result of what Glaro calls “pinpoint maneuverability” which prevents doors and walls from getting banged up and maximizes control in tight spots or when a cart needs to be rotated in place. In self service as well as bellman managed lobbies, we have heard nothing but positive reviews from those using Glaro carts even over bumpy and rough surfaces. They also are known to stand up in extreme weather conditions whether the carts are used by seaside resorts or in winter ski resorts in sub zero temperatures. The other remarkable convenience about dealing with Glaro Inc. and Glaro carts is that they are the only manufacturer we know of that consistently ships carts in three to four days. And almost all carts are shipped by UPS, keeping freight costs to an absolute minimum. When you put all these concepts together, Glaro Inc. bellman carts offer the total package and the confidence you can have in a truly American made product. Information on condo carts can be found here.